The South Building at the Adidas Campus Village expansion has been submitted for building permit review. The building, seen here from Madrona Park, will be built on top of an existing parking garage. Every week, the Bureau of Development Services publishes lists of Early Assistance applications, Land Use Reviews and Building Permits processed in the previous week. We publish the highlights. This post covers December 10th to December 16th, 2018. Four separate structures with a mixed-use program comprised of mulit-family housing(1,125 units total), commercial and parking uses. The project will also include greenway improvements and infrastructure. Design Advice Request to discuss construction of a 14 story building on the site of the former School of Dentistry on the OHSU campus. The project is an expansion of inpatient services. Approximately 200 to 300 parking spaces are proposed for use by patients as part of the project. Approval of the project requires this meeting and a Marquam Hill Parking Review. Proposal is for new residential building with six units. The project intends to meet Community Design Standards of 33.218.140. Project may need adjustments to property line setbacks on southwest, north and west side of property. Zoning is CM3d and RHd. Proposal is the renovation of existing one story concrete building for industrial office and retail sales/service tenants. Divide the property into 4 lots, demolish existing building, construct (4) 3-story mixed used buildings, 19 units each. Vacant lot, add new warehouse and office with onsite parking. New 1-story + mezzanine commercial office space (approximately 7,000 sq ft with on-site parking). Request for adjustment to allow vehicles on the property accessed from SE Center St 33.130.215.B.1.B.2 (building setback). Development of a seven-story mixed use building, consisting of a five-story wood frame building over a two level podium with a concrete structure. Two modifications requested for encroachments into parking spaces and reduce the spacing for bike parking spaces from 24″-18″. The Design Commission has approved the masterplan for the Pepsi Blocks, a 4.97 acre site on NE Sandy Blvd. The masterplan is being designed by Mithun for Security Properties, both based in Seattle. The plan was approved through a Planned Development Bonus Review, a new provision in the zoning code which is available on large sites with mixed use zoning. In return for providing publicly accessible open space, affordable housing, and energy efficient buildings the developers are allowed to construct buildings of up to 120′ in height. Five new buildings of up to 120′ are proposed, providing residential units, retail space, offices, live-work space and below grade parking. 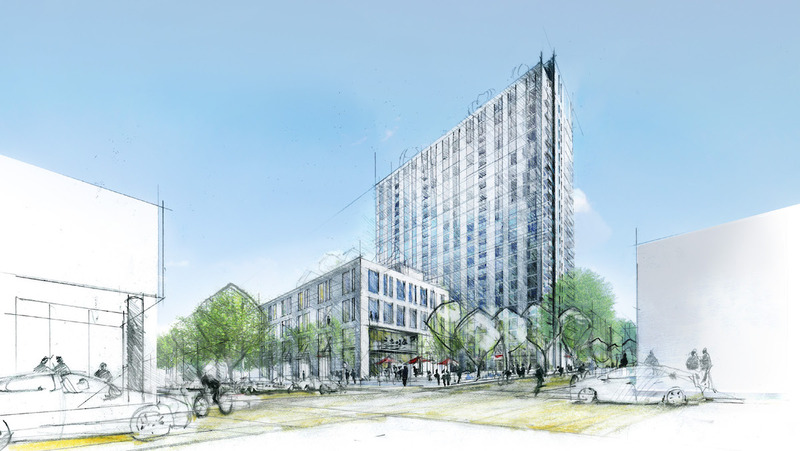 Depending on the ultimate split between office and residential, and the size of the residential units built, the site could provide between 485 and 1,297 housing units. Every week, the Bureau of Development Services publishes lists of Early Assistance applications, Land Use Reviews and Building Permits processed in the previous week. We publish the highlights. This post covers October 1st to October 7th, 2018. New Multifamily building on the R1 section of the site, in accordance with new RM2 code. This portion of the site is presently zoned R1, soon to be RM2. 12 units are proposed. No parking. Storm water is proposed to be with stormwater planters. The Pepsi Blocks Planned Development project includes the phased demolition of existing Pepsi warehouse buildings, renovation of a mid-century Pepsi warehouse bow-truss structure, the development of five new mixed use market rate and affordable residential and office buildings, th introduction of a shared woonerf street along the formerly vacated Right-of-Way, a new Plaza along Sandy Boulevard and a new Park located in the center of development, and associated underground parking. The phasing schedule envisions entitlements and construction of the first phase immediately following Planned Development approval and will continue with four additional phases. The project will use the Planned Development Bonus for additional height and bonus FAR. 6-story, mixed-use development fronting NE Halsey St and the existing Gateway Discovery Park consisting of 40 units of affordable housing and 35 units of market rate housing. 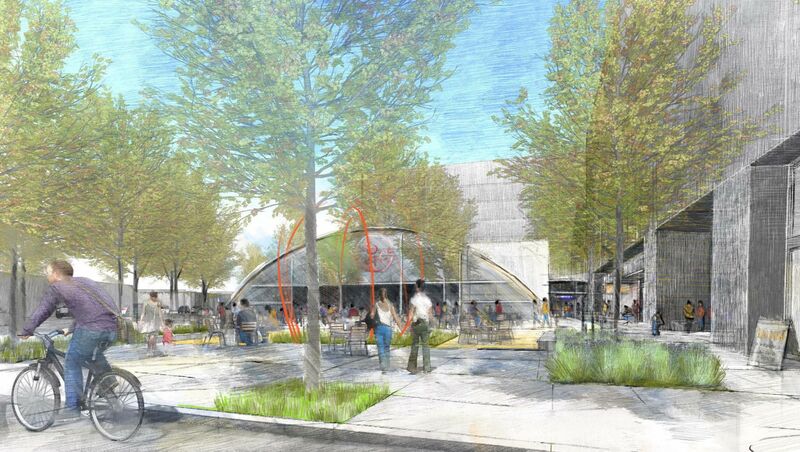 Design Advice has been offered for the redevelopment of the 4.97 acre Pepsi Bottling plant site on NE Sandy Blvd. 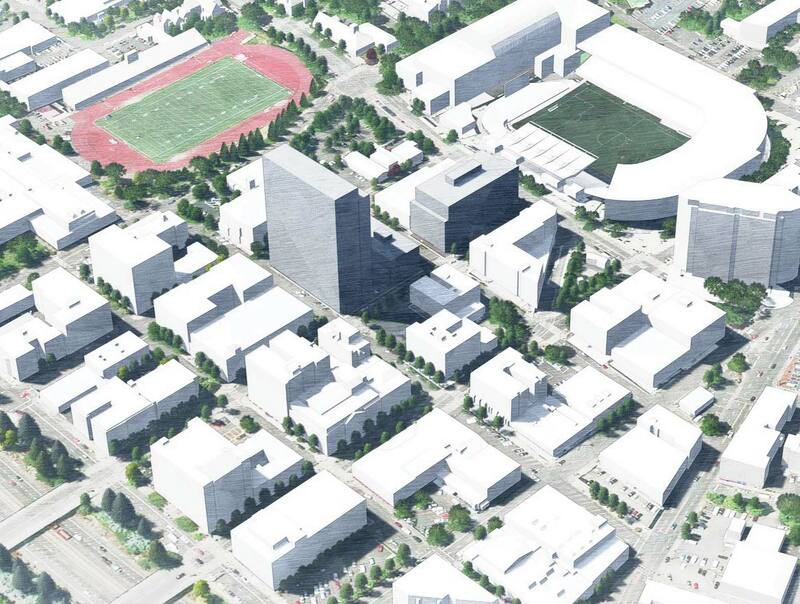 The Pepsi Blocks masterplan is being designed by Mithun for Security Properties, both based in Seattle. Five new buildings of up to 120′ are proposed, providing residential units, retail space, offices, live-work space and below grade parking. The project will required to comply with the city’s Inclusionary Housing policies, which require either 8% of units to be affordable to people earning 60% of area median income or 15% affordable to people earning 80% of area median income. 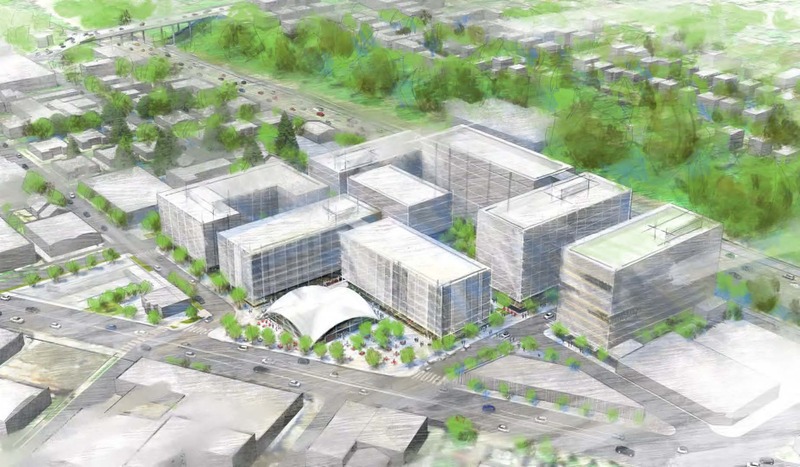 The Pepsi Blocks development will include the retention of the existing mid-century building facing NE Sandy, and the addition of up to 1,000 units. The project is being designed by Mithun Architects for developer Security Properties. 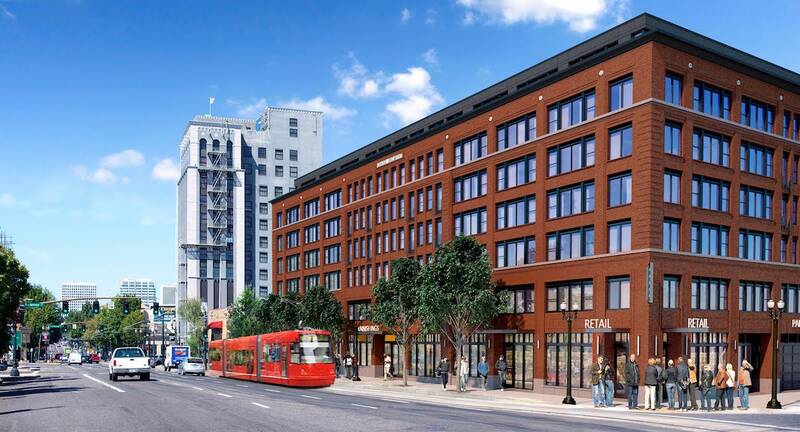 The Oregonian looked at the Brio Lofts at 177 N Failing St and the Zeal Lofts at 3139 N Williams Ave, two micro-apartment developments by the same developer Vibrant Cities, which will also include micro-restaurant space. The Portland Mercury reported on the Housing Bureau’s plans to buy a site at 5827 NE Prescott St, which will be developed with up to 75 affordable apartment units. As the Lotus Lotus Cardroom and Cafe gets demolished to make way for the SW 3rd & Salmon tower, the Portland Business Journal took a look at its past — and its future. With the recent approval of the Moxy Hotel and plans for Block 216 at SW 9th & Alder announced, the Portland Mercury asked whether rampant development is signaling the death of the food cart pod? 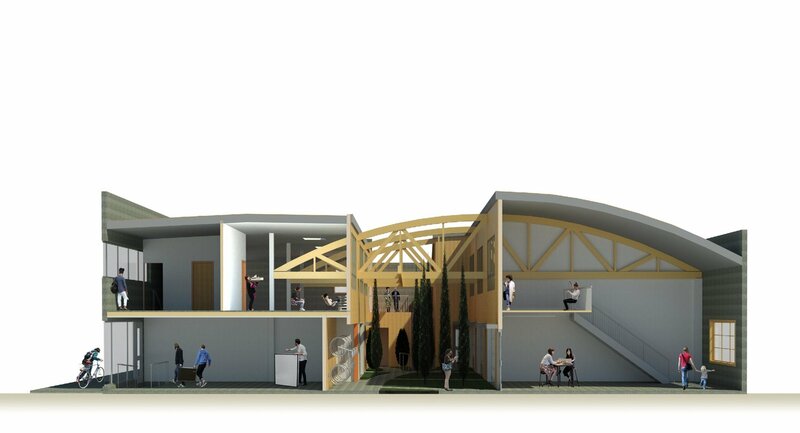 Guerrilla Development’s Pioneer Lavada Jones project will include removing the roof on the existing NE Sandy Blvd building to create a new outdoor courtyard. Every week, the Bureau of Development Services publishes lists of Early Assistance applications, Land Use Reviews and Building Permits processed in the previous week. We publish the highlights. This post covers May 28th to June 3rd, 2018. Planned development for redeveloping the existing Pepsi Bottling Plant on Sandy Boulevard into market-rate and affordable housing, offices, retail/restaurant spaces, publicly-accessible open space, and associated underground parking. Phase 1 of the Planned Development for redeveloping the existing Pepsi Bottling Plant on Sandy Blvd. Includes the renovation of the existing mid-century Pepsi warehouse, two new apartment buildings, below-grade parking and a new publicly-accessible Plaza. 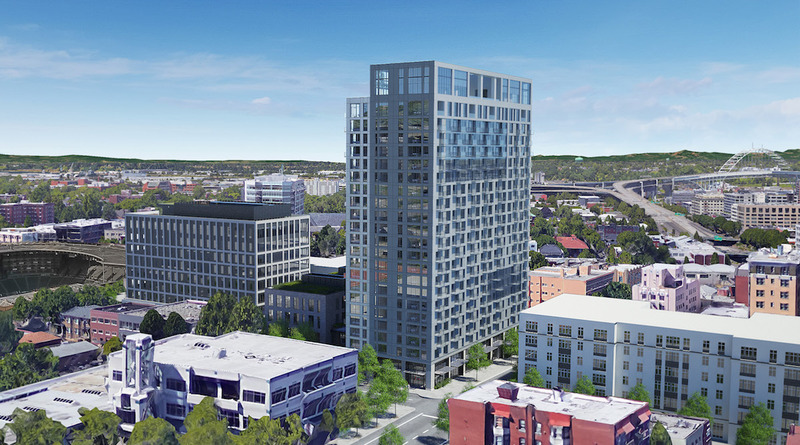 Proposed design replaces existing structure on the south half of the block with a mixed use, 20-story high-rise apartment tower. Ground floor features retail, lobby and amentiy spaces. Parking provided below grade. New 7-story mixed use building with underground parking. They will need to go through a design review. Proposal for a four story with basement structure to house 49 affordable housing units using community design standards for a contributing site in Kenton Conservation District. Proposed storm drainage is a rain garden. Proposal for a new single story three tenant building with two restaurant tenants and one hair salon. Proposal to add 58-89 new multi-family units to existing property that has currently 32 existing multi-family units. Request for early assistance meeting, zoning only for a site in Alphabet Historic District for a development including a new 3-4 story with daylight basement 14-19 units in a multi-dwelling building. The units will be a mix of 1 and 2 bedrooms. There are setback modifications to setbacks on east and west side lot lines and front lot line to exceed RH max building height of 25 feet. No on-site parking; short and long term bike parking to be included. Applicants know they will need a Pre-Application Conference but request this meeting with a planner only now. Proposal is for 160 new affordable rental living units with amenities and 63 parking spaces in RH zone, East Corridor Plan District. Modernization project for Madison High School. A project at 6015 SE 51st Ave has been submitted for building permit review by Studio 3 Architecture. Renovate existing 2-story build; shell only, no occupancy; demo interior partition walls and stairs; build new demising walls to create 10 future tenant spaces, new stairs, (5) new mezzanines, new deck, interior trash room and egress courtyard. Every week, the Bureau of Development Services publishes lists of Early Assistance applications, Land Use Reviews and Building Permits processed in the previous week. We publish the highlights. This post covers March 5th to March 11th, 2018. Note that this post includes some projects that were mistakenly added to the previous week’s metro reports. That post has been updated. Proposal is for an addition of a 1,300 sf retail store in existing Providence Park plaza at corner of SW 20th and SW Morrison Streets and reconstruction of existing ticket windows from 3 locations to 1 – 160sf location. Stormwater for retail store is proposed to be utilizing a green roof, tied into stormwater system. Ticket booth to be connected to existing gutter at existing canopy (new roof area at ticket booth is approximately 50sf). Central City Design District. Renovation of existing 149,000sf, 3-story retail mall anchor to accommodate multiple tenants. Exterior facade remodel and plaza/yard improvements. Current code: Renovation to existing 3-story building with addition of a 4th story. Current Code: Proposal to construct a multi-story 40,00sqft self storage facility with parking. Future code: New mixed use building. Two floors of office space and one floor of residential dwellings (5 units). Future code: Proposed multi-tenant retail building with surface and rooftop parking. Proposed stormwater disposal – drywells. and a pedestrian plaza between the existing church and the new building. Twenty-seven parking spaces are proposed. There is an option to increase the size of the site by acquiring a portion of the lot fronting on SE 136th (331 SE 136th). Current code: Multi-family development on existing site with a total of 29 multi-family units. 23 units are new units with a garage per unit. Existing 6-plex to remain with parking provided for each unit in a parking lot. Two existing single-family dwellings are proposed to be separated from the development through PLAs or other process. Future code? A master plan for redeveloping the existing +/-5.16 acre Pepsi Bottling Plant on Sandy Blvd into market-rate and affordable housing, offices, retail/restaurant spaces, open space and associated parking. The project will use the Planned Development Bonus for additional height and bonus FAR and will include publicly-accessible open space. New 7-story mixed use building, Type I construction and 5 stories of Type IIIA construction; level 1 – commercial spaces and parking; level 2-7 – 131 residential units. 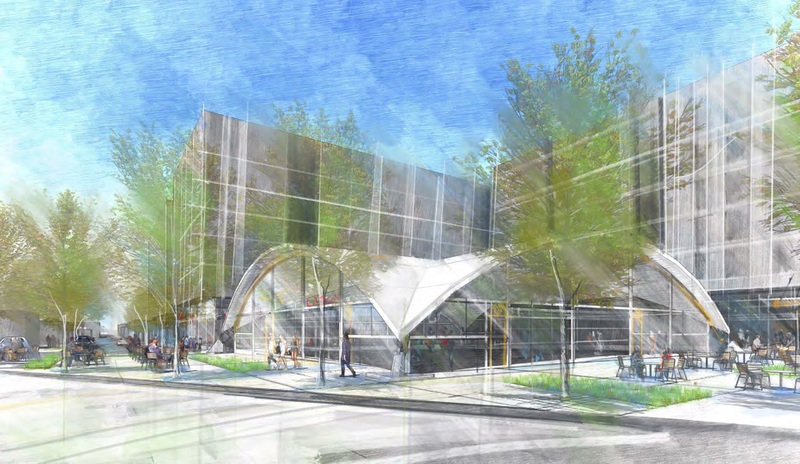 The Design Commission has approved the Press Blocks, the redevelopment of the former Oregonian publishing buildings in Goose Hollow. The development will include three buildings, spread over one and a half city blocks. The project is developed in partnership by Urban Renaissance Group and Security Properties. The architects are Portland based GBD Architects and Seattle based Mithun. According to the Portland Business Journal the sale of the former Oregonian printing facilities in Goose Hollow has closed. Urban Renaissance Group and Security Properties paid $20 million for the site, which is set to be redevelopment as the Press Blocks. The Business Tribune wrote about the new leadership at Holst Architecture. After more than 20 years, Mark Edlen has handed over the reins at Gerding Edlen, reports the Portland Business Journal. The NW Examiner reported that the amount of ground retail at the Vista Pearl (formerly Block 20) will be reduced from what was originally approved. The Portland Bureau of Transportation is looking for feedback on what type of bike parking should be required at new apartment buildings, reported BikePortland. The prospect of lower corporate taxes under President Trump is having a chilling effect on one of the main sources of financing for affordable housing developments, wrote the Portland Mercury. Local projects affected include Innovate Housing’s NW 14th & Raleigh development, which now has a $1.8 million funding gap. The Portland Business Journal took a look at the Swift Headquarters, completed last year in the former Rose City Awnings building in NW. As part of their Architect’s Questionnaire series, Portland Architecture interviewed Nat Slayton of ZGF Architects. Design Advice has been offered for the Press Blocks, the redevelopment of the former Oregonian publishing buildings in Goose Hollow. The development would include three buildings, spread over one and a half city blocks. The project is developed in partnership by Urban Renaissance Group and Security Properties. The architects are Portland based GBD Architects and Seattle based Mithun. Around 350 vehicular parking stalls and 500 long term bicycle parking spaces would be provided, in underground garages. 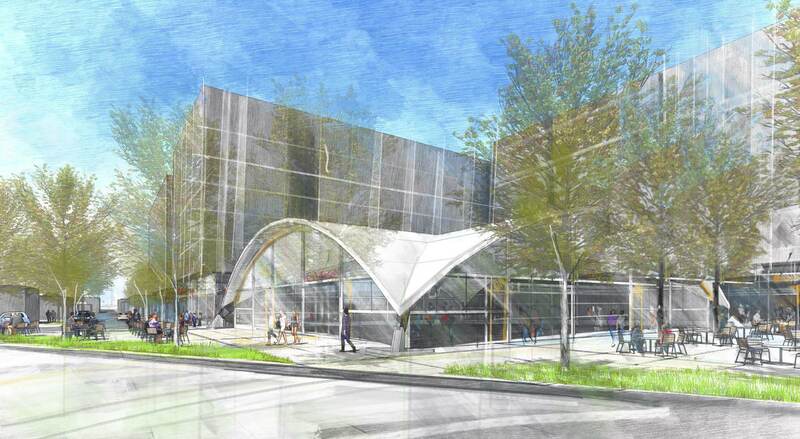 An existing tunnel under SW 17th Ave would be retained, in order to provide a pedestrian connection between the two garages.